Draw a line segment of length 7.6 cm and divide it in the ratio 5:8. Measure the two parts. Give the justification of the construction. A line segment of length 7.6 cm can be divided in the ratio of 5:8 as follows. Step 1 Draw line segment AB of 7.6 cm and draw a ray AX making an acute angle with line segment AB. Step 2 Locate 13 (= 5 + 8) points, A1, A2, A3, A4 …….. A13, on AX such that AA1 = A1A2 = A2A3 and so on. Step 4 Through the point A5, draw a line parallel to BA13 (by making an angle equal to ∠AA13B) at A5 intersecting AB at point C.
C is the point dividing line segment AB of 7.6 cm in the required ratio of 5:8. The lengths of AC and CB can be measured. It comes out to 2.9 cm and 4.7 cm respectively. From the figure, it can be observed that AA5 and A5A13 contain 5 and 8 equal divisions of line segments respectively. Construct a triangle of sides 4 cm, 5cm and 6cm and then a triangle similar to it whose sides are of the corresponding sides of the first triangle. Give the justification of the construction. Draw a line segment AB = 4 cm. Taking point A as centre, draw an arc of 5 cm radius. Similarly, taking point B as its centre, draw an arc of 6 cm radius. These arcs will intersect each other at point C. Now, AC = 5 cm and BC = 6 cm and ΔABC is the required triangle. Draw a ray AX making an acute angle with line AB on the opposite side of vertex C.
Locate 3 points A1, A2, A3 (as 3 is greater between 2 and 3) on line AX such that AA1 = A1A2 = A2A3. Join BA3 and draw a line through A2 parallel to BA3 to intersect AB at point B'. Draw a line through B' parallel to the line BC to intersect AC at C'. ΔAB'C' is the required triangle. Construct a triangle with sides 5 cm, 6 cm and 7 cm and then another triangle whose sides are of the corresponding sides of the first triangle. Construct an isosceles triangle whose base is 8 cm and altitude 4 cm and then another triangle whose side are times the corresponding sides of the isosceles triangle. Draw a triangle ABC with side BC = 6 cm, AB = 5 cm and ∠ABC = 60°. Then construct a triangle whose sides are of the corresponding sides of the triangle ABC. 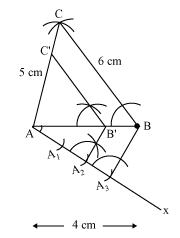 Draw a triangle ABC with side BC = 7 cm, ∠B = 45°, ∠A = 105°. Then, construct a triangle whose sides are times the corresponding side of ΔABC. Give the justification of the construction. Draw a right triangle in which the sides (other than hypotenuse) are of lengths 4 cm and 3 cm. the construct another triangle whose sides are times the corresponding sides of the given triangle. Give the justification of the construction. Draw a circle of radius 6 cm. From a point 10 cm away from its centre, construct the pair of tangents to the circle and measure their lengths. Give the justification of the construction. Construct a tangent to a circle of radius 4 cm from a point on the concentric circle of radius 6 cm and measure its length. Also verify the measurement by actual calculation. Give the justification of the construction. Draw a circle of radius 3 cm. Take two points P and Q on one of its extended diameter each at a distance of 7 cm from its centre. Draw tangents to the circle from these two points P and Q. Give the justification of the construction. Draw a pair of tangents to a circle of radius 5 cm which are inclined to each other at an angle of 60°. Give the justification of the construction. Draw a line segment AB of length 8 cm. Taking A as centre, draw a circle of radius 4 cm and taking B as centre, draw another circle of radius 3 cm. Construct tangents to each circle from the centre of the other circle. Give the justification of the construction. Draw a circle with the help of a bangle. Take a point outside the circle. Construct the pair of tangents from this point to the circles. Give the justification of the construction. 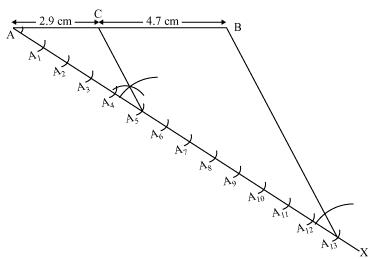 Let ABC be a right triangle in which AB = 6 cm, BC = 8 cm and ∠ B = 90°. BD is the perpendicular from B on AC. The circle through B, C, and D is drawn. Construct the tangents from A to this circle. Give the justification of the construction. Maths : CBSE NCERT Exercise Solutions for Class 10th for Constructions ( Exercise 11.1, 11.2 ) will be available online in PDF book form soon. The solutions are absolutely Free. Soon you will be able to download the solutions.